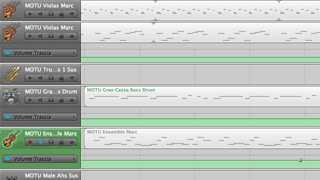 Garageband is quite useful even when using pro sequencers for real work. It allows to sketch a tune easily, even on a low end MacBook or iMac. I usually work with Finale and Cubase, and I love them, but Garageband's ease of use is hard to beat. I found out that using Garageband with Motu Symphonic Orchestra's virtual instruments, the audio tracks kept clicking and cracking. It's not an hardware issue - I tried both with an iMac 2g and an 8 core MacPro with 8 gigs of ram: same result. This issue is not always there. Only some "songs" have problems, and it happens with all the versions of Garageband I tried: 3 as well as iLife 08 and 09. The solution is easy, and I found it out comparing project with and without the cracking problem. The same virtual instrument should not be used in more than one track. In the project above, the Viola was in two tracks. By copying and pasting them into a single track, the distortions disappeared. hi, after weeks of asking on forums and trying dozens and dozens of mixes I see you post herre and wonder if this is my problem. I really am at the end of my tether. I call it random crackling and it appears on some songs and not others and can also be in diffrent places in the same song on diffrent mixes but is ALWAYS there. I have one song whih uses a soft synth called Alchemy which si awesome so I use it a lot. Does what I describe sound like the issue you have had? I rarely is heard when I play a song back in GB itslef but always rears its head when Ive either made an ilife preview or certainly when Ive converted the song to iTunes regardless of how many tracks and FX I delete to save CPU energy etc...nothing is getting rid of this sound and some songs just dont have this problem at all. Can you help? Nope, didn't solve it. It really sounds like power interference to me, but it is so random there is nothing on in the house at that frequency of switching on and off. I wonder if the Mac internally is working hard to operate would it create this? I'm using the latest Garage Band ($7.99 app Jan 2016) and it appears to be the same sound as I hear on Youtube videos, but their fix did not resolve it. Interesting that Apple never posts an answer on these forums, they may have the answer?? ?